Rapidly rotating black holes can behave quite differently from their more slowly revolving cousins. In particular if a compact objects orbits near the horizon of a nearly maximally rotating black hole the radiated flux of gravitational waves starts to decreases as the orbit inspirals, exactly opposite to usual increase that is observed (which gives rise to the ‘chirping’ behavior of black hole binaries). The below figure is taken from our ‘Inspiral into Gargantua‘ paper and shows this decrease in flux near the horizon for an object on a circular orbit around a black hole. 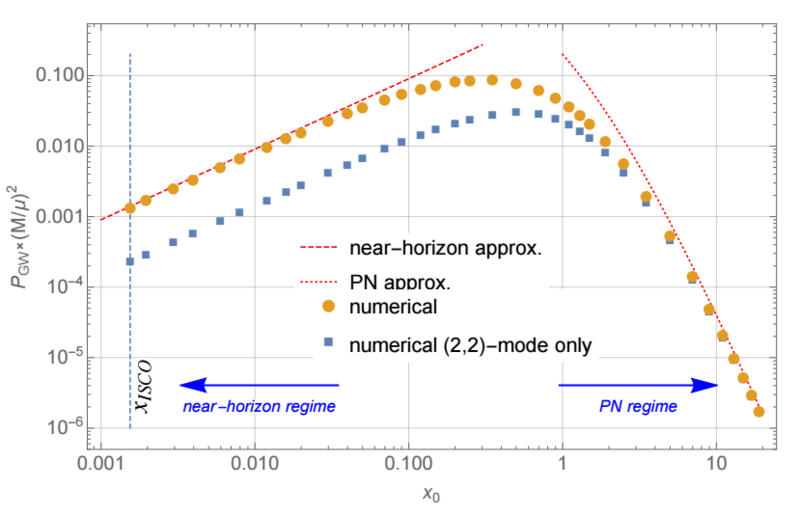 A nice feature of the near-horizon regime of a nearly-extremal black hole is that extra symmetries arise. This allows the amount of flux to be calculated analytically as shown by the red dashed line on left of the above figure. The analytic result is given as an expansion deviation from extremality and we give the leading term in our ‘Particle on the Innermost Stable Circular Orbit of a Rapidly Spinning Black Hole‘ paper. The resulting formula for the flux is not too complicated but requires the calculation of spin-weighted spheroidal harmonics to evaluate. This Mathematica notebook allows the calculation of the radiated flux for the scalar and gravitational cases.